It is estimated there are approximately 1.17 million Indigenous people in Canada (Statistics Canada, 2010b), but this has never been accurately determined, as many Indigenous people do not participate in the national census (Toronto Star 2008). The largest percentage of Indigenous people lives in the Province of Ontario, followed by British Colombia, Manitoba and Alberta. British Colombia has the highest diversity of Indigenous Peoples. The Canadian population is aging, with the exception being Indigenous communities where almost half their population is under the age of 25 (Statistics Canada, 2011). The term ‘Aboriginal peoples’ is used in Canadian law rather than ‘Indigenous Peoples’ and will be used from time to time throughout this paper when citing Canadian sources. The Canadian Constitution Act, 1982 states, “Aboriginal peoples of Canada includes Indian, Inuit and Métis peoples” (section 35). There is great diversity amongst the Indigenous Peoples of Canada. Recognizing and supporting conservation by indigenous peoples and local communities. 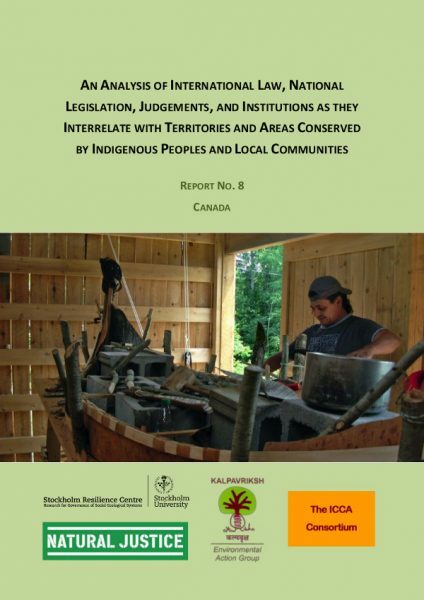 Analyses of international law, national legislation, judgments, and institutions as they interrelate with territories and areas conserved by indigenous peoples and local communities.